Well, I finally found a solution– My Gotta Chop Paleo Almond Butter Cups!. Eating a Paleo diet has definitely saved my life, and probably my FEET. Being diabetic, nerve damage and poor blood circulation from high blood sugar is one of the reasons so many diabetics loose their feet and legs. I don’t want to be one of those people, so I decided to take control of my life again and start eating a clean healthy diet. The reason that I made almond butter cups instead of peanut butter cups is because peanuts are not a Paleo friendly food. Peanuts are not nuts, but they are legumes and they contain phytic acid, lectin, and aflatoxins. Also, so many people have peanut allergies and problems with digesting them. The Gotta Chop Paleo Almond Butter Cups Recipe contains organic and more healthy ingredients than those over-processed store bought candies with all their needless chemicals and they taste great too. It is Tuesday afternoon and I need a little pick me up. I am feeling a bit snacky, so I search the kitchen for something to make. 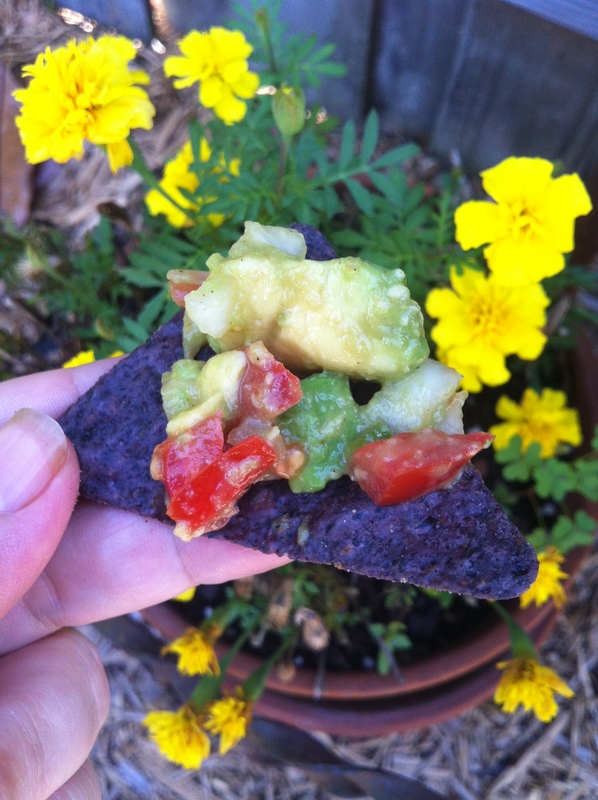 I found an avocado, tomato, onion, jalapeño, and some organic blue corn chips, so I thought why don’t I make a little guacamole pico de gallo…yum! I chopped up my onion, tomato, avocado, and a little jalapeño and added them to a bowl. I added some sea salt, ground black pepper, garlic powder, a dash of cayenne pepper, and a little drizzle of cold pressed extra virgin olive oil and gently mixed everything together. I grabbed my bowl of guacamole pico de gallo and my chips and a good book and headed outside to find a nice shady spot to sit and read and enjoy my yummy snack I just whipped up. What a beautiful day it is outside, and it just got better with my healthy little snack. Hope you enjoy your day too, and try some guacamole pico de gallo too, you will be glad you did.